We will now introduce some of Jeju's famous foods to visitors, and will describe some of its restaurants and bars that are nearby to the conference event. 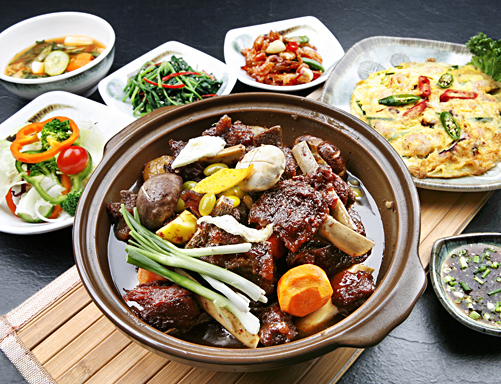 Naturally, seafood has a strong influence on Jeju's cuisine. Chinese and Japanese restaurants cater to the island's main visitor market, but it is really worth getting stuck into the local fare, much of which comes loaded with a promise of good health if you eat enough of it, and particularly if consumed in season. Okdom is a type of fish found only in the sea off Jeju and Japan; it is sometimes broiled with a sesame oil basting, or served as a soup with seaweed. Abalone is reckoned to be at its best in summer, and is often served in a porridge. Mom-guk is a non-fatty seaweed and pork broth, and Haemul-ttuk is a highly spiced seafood soup. Much is also made of local horsemeat and black pork, which some may find too chewy. Jeju's nutty buckwheat pancakes, filled with radish or red beans, are really good, however the bouquet and finish of Omegi wine, made from glutinous millet, might not suit all palates. There are loads of pheasant dishes, reckoned to be best in the autumn. The flavour of the Jari, a small fish like a perch, is thought to peak from May to August. Soju is a Korean traditional wine made from rice and other starches such as potato, wheat, barley, sweet potato, or tapioca. Soju is clear in color and typically varies in alcohol content from about 20% to about 45% alcohol by volume (ABV), with 20% ABV being most common. Its taste is comparable to vodka, though often slightly sweeter because of the sugars added in the manufacturing process. We will post more details of these soon!